Sustainable entrepreneurship has attracted growing attention in both scholarly and practitioner circles. Focusing on generating social, environmental and business value, the notion has been raised more recently to address the contribution of entrepreneurial activities to sustainable economic and social development. Sustainable Entrepreneurship and Social Innovation builds on a theoretical framework that addresses related topics via a combination of insights from sustainability, policy, managerial, strategic, innovation and institutional perspectives. 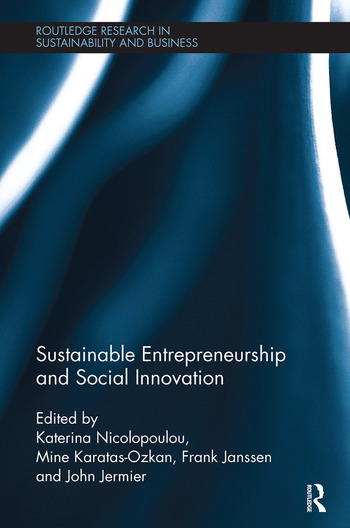 Providing empirical casework as well as a conceptual and theoretical framework, the book takes a global, interdisciplinary approach to the emergent field of sustainable entrepreneurship. The book highlights elements of sustainable entrepreneurship which have a societal impact as well as regional relevance and related aspects of innovation are also presented. Definitional issues are further elaborated in order to encompass the main inter-connected fields of study, sustainable entrepreneurship and social innovation. This book is an important resource for academic researchers, and postgraduate and advanced undergraduate students in the fields of entrepreneurship, innovation and sustainability. Sustainable Innovation and Entrepreneurship in agriculture: Empirical insights into the SME ecosystem Tunalioglu, R., Karatas-Ozkan, M., Yavuz, C., Bektas, T., Cobanoglu, F., Howells, J. and Karaman, A. D.
Katerina Nicolopoulou is a Senior Lecturer at the Hunter Centre for Entrepreneurship, Strathclyde Business School, UK. Mine Karatas-Ozkan is a Professor of Strategy and Entrepreneurship at the University of Southampton, UK. Frank Janssen is full Professor of Entrepreneurship at the Louvain School of Management, Université catholique de Louvain, Belgium. John Jermier is Professor of Sustainable Enterprise Research at the University of South Florida, USA.